The five membered heterocyclic compounds are extremely stable and show aromatic character. The significant members of this group are thiophene, pyrrole and furan. Thiophene and pyrrole come about in coal tar in small amounts. Throughout the fractional distillation of coal tar, thiophene (boiling point 83oC) is collected all along with the benzene (boiling point 80o C) therefore ordinary benzene for all time contains around 0.5% of thiophene which should be treated if thiophene free benzene is desired. Thiophene is as well present in the shale oil and pyrrole in bone oil. Furan is present in the distillate of the pine-wood. The pyrrole ring system takes place in a large number of naturally occurring substances. Example: chlorophyll, haemin, cyanocobalamin (Vitamin B12), alkaloids, auxins and so on. We are very much familiar with the nomenclature. The ring atoms are numbered in such a way that the hetero atom is given the lowest number or whenever utilizing the Greek numbering, the carbon atom subsequent to the hetero atom is designated as α- whereas the next to them is β-carbon atom. The radical's thienyl-, furyl- and pyrryl- are derived from the thiophene, furan and pyrrole correspondingly by substituting one hydrogen atom. The position of the hydrogen substituted is pointed out by the number of carbon atom, example: 2-thienyl-, or 3-thienyl- and so on. The five membered Heterocyclics or their derivatives might be synthesized through the reactions of 1, 4-dicarbonyl compounds by a suitable source of hetero atom. Thiophene can be synthesized on an industrial scale through the high temperature reaction among n-butane and sulphur. From Coal tar: Thiopene (boiling point 84o C) is collected all along by benzene (boiling point 80oC) throughout the fractional distillation of coal tar. Pyrrole is as well found in small quantity in coal tar. Furan is most readily made up via decarbonylation of furfural. A) They are colourless liquids. B) The boiling point of furan, thiophene and pyrrole are approximately 32oC, 84oC and 129oC correspondingly. The comparatively high boiling point of pyrrole is because of related intermolecular H-bonding. Similar to benzene they show aromatic characters and are resonance stabilized. Their resonance energies are though lower than that of benzene and decrease in the order of thiophene > pyrrole > furan. Though, dissimilar to benzene, the dipolar structures are significant contributing structures to stability. The entire ring atoms are in sp2 hybridization state and the ring is planar. A total of six π electrons comprising of two π and one lone pair are available for the delocalization and therefore they show aromatic characters. Due to their aromatic characters, they are resistant to addition reactions such as hydrogenation. 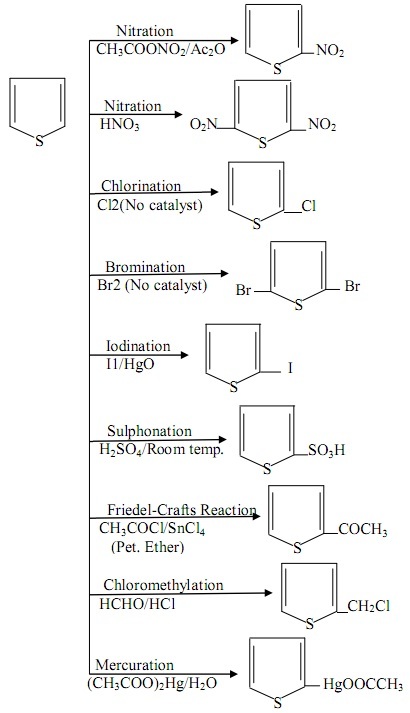 Their significant reactions are electrophilic substitution reactions at carbon. 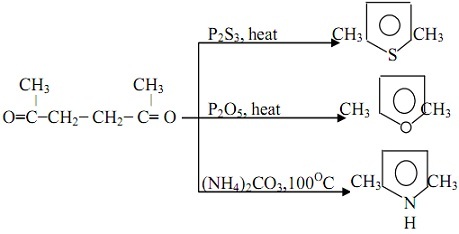 The electrophilic substitution reactions can be most closely compared to those of the phenols. Furan is less reactive than the pyrrole as oxygen accommodates a positive charge less readily than nitrogen. The thiophene is less reactive than Furan as the +M effect of sulphur is smaller than that of oxygen. Due to the greater reactivity of these rings systems, they can experience substitution reactions beneath milder conditions. The electrophilic substitution take place either at α- or β- position. 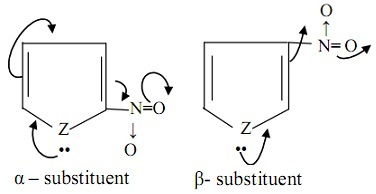 Though, due to a greater stabilization of the intermediate carbocation formed throughout α- substitution compared to the intermediate carbocation made in the β- substitution, the former place is preferred. Different substituents influence the rate and position of electrophilic attack. For illustration, electron donating groups increase the reactivity to such a level that the resulting compounds are highly unstable. Illustrations of electron donating groups are: -NH2, -NR2, -OH, -OR. Electron withdrawing groups like -NO2, -SO3H, -COOR and so on reduce the reactivity and stabilizes the ring through increasing resonance by the hetero atom. Even with electron withdrawing group attached, the incoming substituent enters just 2 or 5 position. Heterocyclics not stabilized through electron withdrawing substituent are therefore highly reactive. 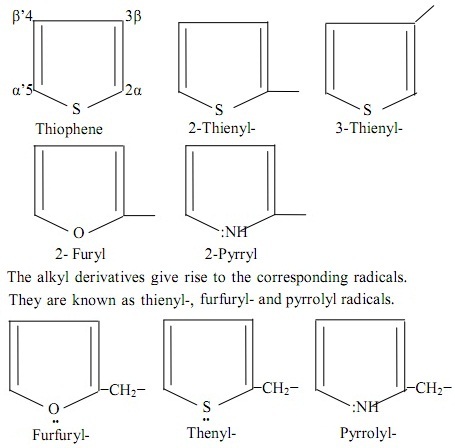 Now, we are going to take a closer look at the reactions of the individual members of the five membered Heterocyclics. A) Physical Properties: This is a colourless liquid having a boiling point of 85oC. It is insoluble in water however soluble in the organic solvents. B) Chemical Properties: Thiophene looks like benzene in most of its chemical reactions. This might be as they encompass similar molecular mass, similar shapes of molecules and particularly same electronic structures. Thiophene goes through most of the electrophilic substitution reactions shown by benzene. These reactions are summarized below. Thiophene is catalytically reduced to tetrahydrothiophene. This can be catalytically reduced by hydrogen by using Raney nickel as catalyst to provide n-butane. It reacts by butyl-lithium to give 2-thienyl lithium that shows the entire usual reactions of organolithium. Thiophene doesn't get oxidized to sulphoxide or sulphone as it doesn't form sulphonium salt. Though, it reacts by hydrogen peroxide and this leads to the opening of the ring and sulphur is oxidized to the tetraoxosulphate (vi) acid. It is decomposed via potassium with the formation of potassium sulphide. Indophenin reaction: Thiophene whenever treated with isatin and concentrated tetraoxosulphate (vi) acid generates a blue colour. This is a colourless liquid having a boiling point of around 31oC. This is nearly insoluble in water however soluble in alcohol and ether. It consists of characteristic chloroform similar to smell. Furan looks like thiophene in its chemical reactions however it is more reactive. It behaves as diene and also an aromatic compound. a) Hydrogenation: This can be catalytically reduced via hydrogen in the presence of lead or Raney nickel catalyst to make stable saturated cyclic ether termed as tetrahydrofuran (THF). This is unstable in air and it reacts by oxygen to form 2, 5-peroxide that readily polymerizes. It goes through Diel-Alder reaction as it behaves as diene. For illustration by maleic anhydride, it makes a 1, 4-adduct that on treatment by a mineral acid example: HBr undergoes dehydration to outcome the phthalic anhydride. This react with acetic acid in the presence of sodium acetate and bromine to form 2, 5- diacetoxy-2, 5-dihydrofuran. a) This is highly sensitive to strong acids resultant in the polymerisation reaction. b) It is highly reactive and make poly substituted product even at little temperature. c) It undergoes 2, 5-addition in preference to the substitution reactions. The given reactions are the significant electrophilic substitution reactions of furan. In the presence of strong acids, the furan polymerizes to make complex products. Furan reacts by butyl-lithium to provide 2-furyllithium that undergoes the usual reactions of organolithium compounds. 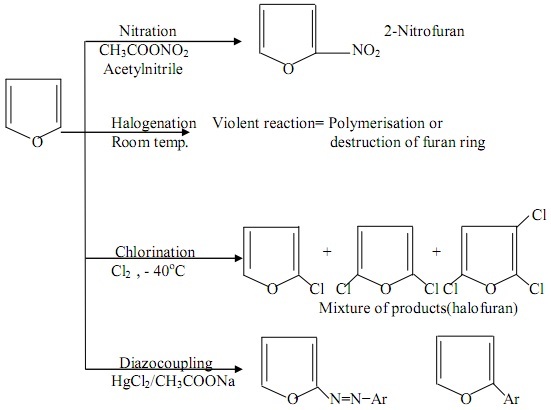 Furan reacts by ammonia, NH3 at around 450oC in the presence of aluminium to form pyrrole. It as well reacts by P4S7 to give thiophene. The molecular formula of Pyrrole is C4H5N. It is the nitrogen analogue of furan and thiophene. It looks like furan and thiophene and its synthesis from succinic acid points to the cyclic structure of furan. The aromatic nature of pyrrole as illustrated in its resistance to additions and ease of electrophilic substitutions is illustrated in terms of either resonance or molecular orbital theory. Its resonance energy is approximately 21kcal/mol. The double bond illustrated in its classical structure (I) are not true double bonds, therefore it is expected to be resistance to addition reaction. As well the non-availability of the lone pair of electrons at nitrogen describes the lack of fundamental character. Molecular orbital Concept: The whole carbon and nitrogen atoms in pyrrole are in sp2 hybridization state and form σ bonds by three other atoms by overlap of trigonal sp2 hybrid orbitals. Therefore all the C and N lie in the similar plane at an angle of 120oC to one other. At each of the carbon there is one unhybridized p-orbital carrying one electron whereas the unhybridized p-orbital of the nitrogen atom takes the lone pair of electrons. The p-orbitals are at right angles to the plane of the ring atoms and they overlap by one other to form a delocalized π- molecular orbital electron cloud above and beneath the plane. This cloud includes six electrons needed for aromaticity and thus describes the stability of pyrrole to addition reaction and its tendency to go through substitution reaction. The non-availability of lone pair of electron of the nitrogen due to its involvement in the π electron cloud, describes the weak basic character of the pyrrole. A) Physical Properties: This is a colourless liquid having a boiling point of 131oC. It is sparingly soluble in water however fairly soluble in the ethanol and ether. It darkens whenever exposed to air. B) Chemical Properties: Pyrrole distinct markedly in chemical properties from thiophene and furan. Though it goes general electrophilic substitution reactions. It consists of amphoteric properties and behaves similar to very weak base due to the withdrawal of electron density from nitrogen through aromatic sextet and as a weak acid due to greater stabilization by pyrrole. Pyrrole on reduction by zinc and acetic acid makes pyrroline (2,5- dihydropyrrole), which on heating by hydriodic acid and red phosphorus outcomes pyrrolide (tetrahydropyrrole). This is a very weak secondary base and dissolves slowly in the dilute acids. This is due to the withdrawal of lone pair of electrons from nitrogen towards aromatic sextet making it accessible for protonation by acids. Pyrrole is weakly acidic in nature unlike furan and thiophene. It therefore reacts by metallic potassium or potassium hydroxide to prepare potassium salt that can be hydrolyzed back to pyrrole on treatment with water. - The comparatively easy dissociation of the proton linked to N.
- The greater stability of the pyrrole anion as compared to pyrrole. Pyrrole is very reactive towards the electrophilic substitution reactions. It exhibits striking likeness to phenol and aromatic amines. 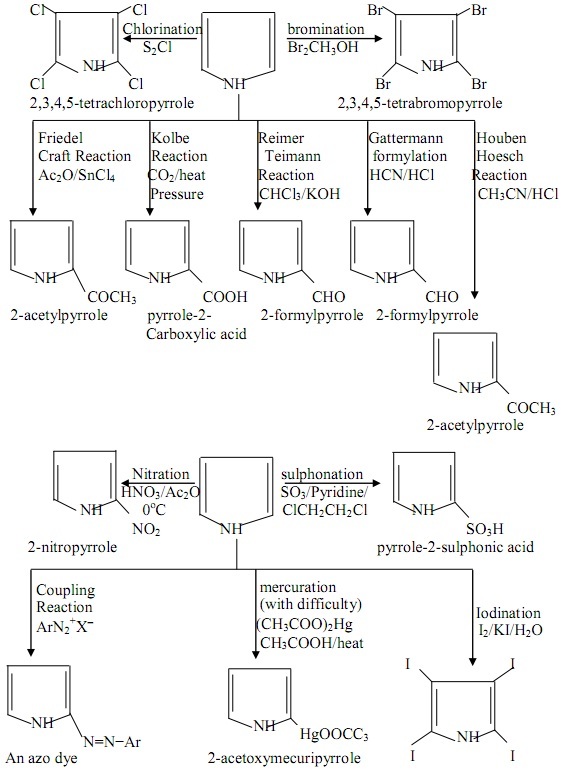 It goes on Kolbe, Reimer-Tiemann, Gattermannformylation, Houben-Hoesch and coupling reactions. Pyrrole reacts by dichlorocarbene, made by the interaction of chloroform and sodium ethoxide to give provide β-chloropyridine via ring expansion. The Pyrrole ring opens up to provide succinaldehyde dioxime whenever refluxed by an ethanolic solution of the hydroxylamine.